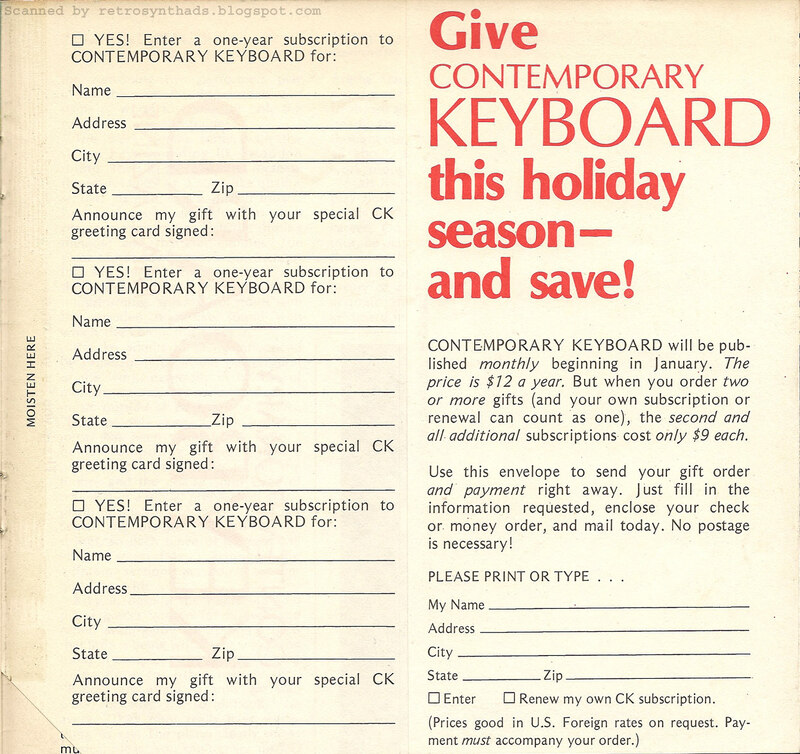 Subscription forms in Contemporary Keyboard November/December 1976. 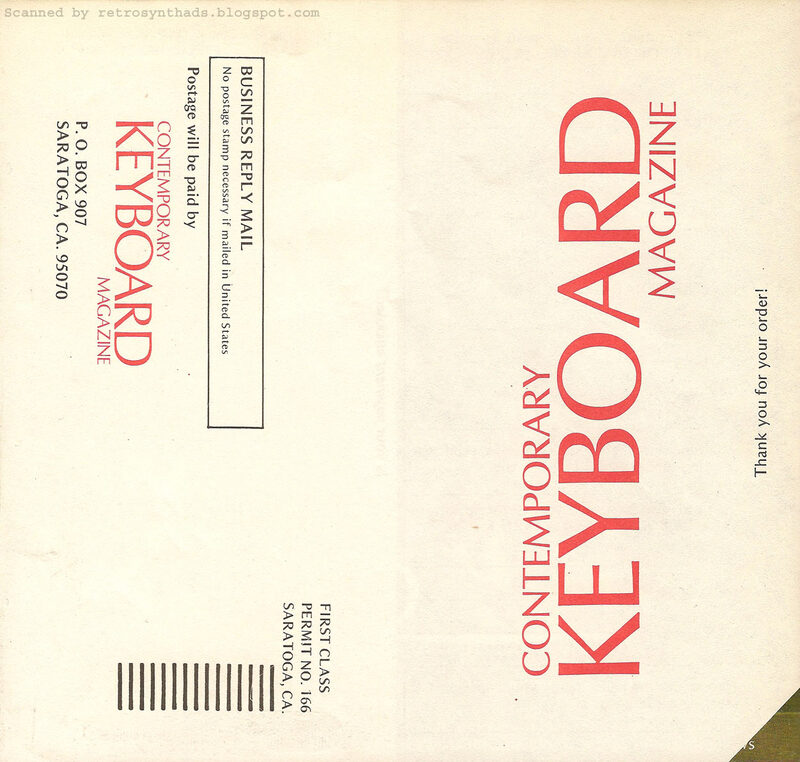 It seems like only yesterday that Contemporary Keyboard magazine subscription promos were all about "inspiration" and Michelangelo-like imagery. One year later, and CK decided to get a little more... er... contemporary... with their own advertisements. Because, really, that's what they are - advertisements for CK. In CK. 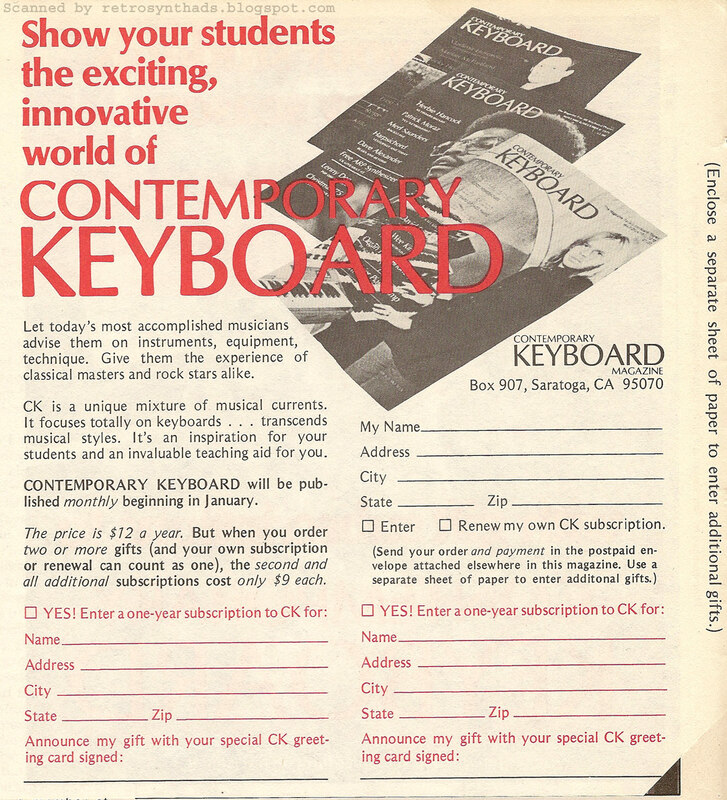 The magazine was still young and CK was still in that initial stage of increasing subscribership. 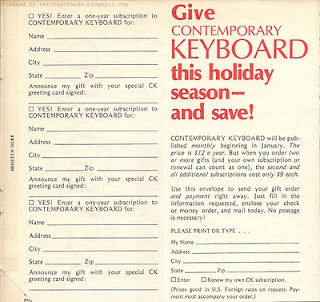 And in the holiday season of 1976, they decided to take two different approaches - both mainly geared towards giving a subscription of CK as a gift. Interestingly, CK kept the "inspire" theme going from the original subscription forms I blogged about in my last post. Also, CK made sure not to exclude any teachers, by adding the line, "Give them the experience of classical masters and rock stars alike". The form itself has room for two gift subscriptions that includes a space for a special CK greeting card content (excellent! ), as well as space for the reader to start or renew their own subscription. That's three forms in one - good use of space. I'm not sure if they had already received some marketing data indicating a high percentage of teachers as part of the their readership, or if it was just a hunch by someone working in the office. But, targeting a specific audience can backfire against any other groups that might also be interested in subscribing. So, it's a good thing that further into the magazine readers come across this more generalized holiday gift promo. Just look at that photo. That awesome Minimoog. That awesome hair. That awesome Odyessy Axxe. That awesome hair. And... that awesome hair. 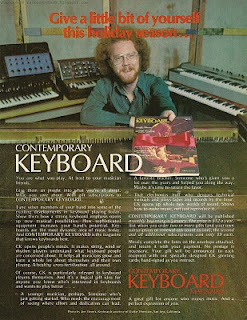 I'd "take a little bit" of that (the synths, not the hair. Ok... some of that hair...). This full page advertisement provides for a lot more room for ad-copy, and it's a total hard-sell, pushing the magazine towards all audiences. Fellow band members, young musicians, favorite teacher, and electronics buff. Plus, they also give you a deal if you order more than one subscription - only $9 an issue. Excellent! 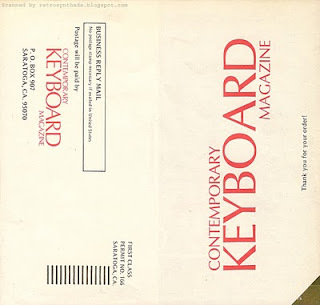 CK also announces that CK will start being published monthly starting January 1977. Up until then the magazine was being published every two months. Attached to this full page ad is the envelope/form itself. Again, we have room for multiple gift forms, and again a form for the gifter as well. Four in all. Because this full page ad and form was directed more towards a general audience, rather than just teachers, I would have liked to have seen the ratio of incoming forms. It would have provided some good data about the readership or whether the more directed form worked well. I'll probably just flip through some later issues at some point. If it worked, I'm sure I'll see more directed promos in future issues. Interestingly, I took a quick look and holiday- themed ads are few and far between. One of the ones I can remember was SCI's holiday accessories/merchandise ad from 1982. But even it didn't really mention the holidays. Gah! I'll dig through some more issues and try and find some. 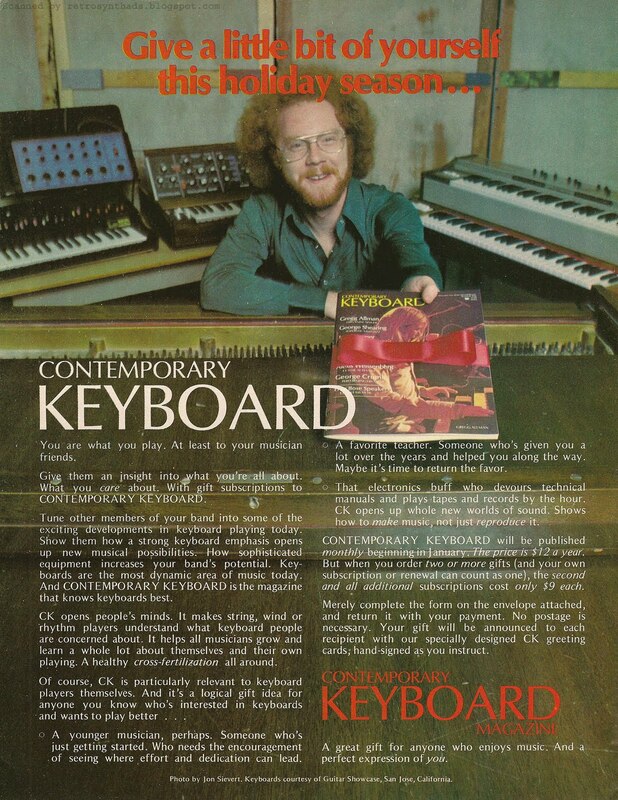 Regarding "awesome 'fro man", I believe the synth in the background is an Axxe, not an Odyssey. You can tell by the scalloped sides (Oddys had theirs continue in a straight line). Good catch! Made the correction, thanks muchly! 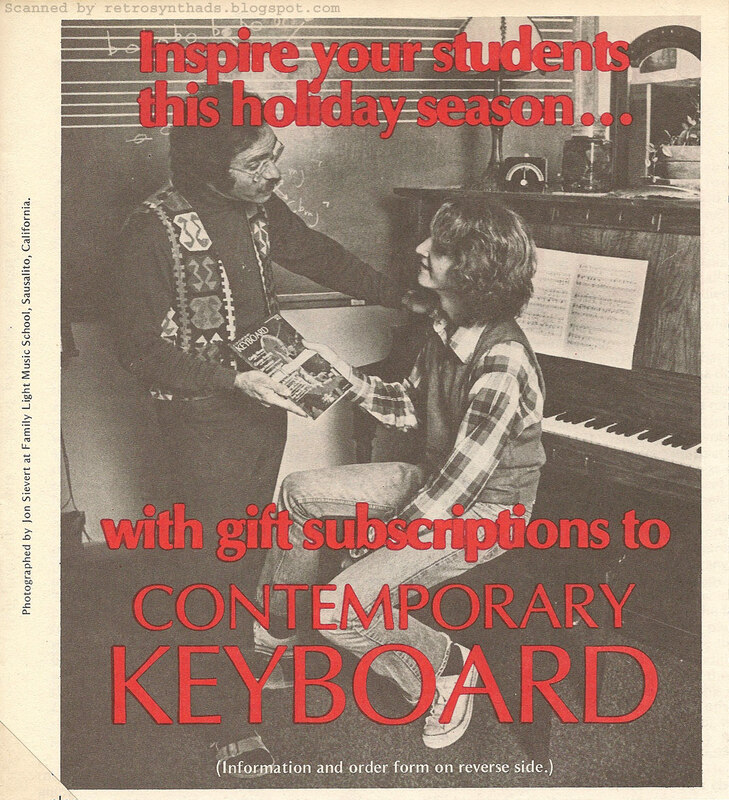 That first Contemporary Keyboard picture is just screaming for a caption contest.